As a mom, isn’t it we always want what is best for our children? That includes quality education, some of the latest game consoles, neat clothes, healthy food and a safe and friendly community they could grow up in. Hubby and I have always wanted these things for the children. Now as a young couple, one of our dreams is to have our very own house. “Someday mahal, someday,” he promised that to me. Currently, we still live with my parents because I support both of them and secondly, it’s more practical than renting an apartment. We agreed not to rent, but to work harder and aim to get our own house. While on the search for our dream house, we constantly check-out developed and pre-selling condominiums or townhouse units here and there. We’ve gone to a number of residential tours of some known developers. We are looking not just for a place to live in, but a community where my kids could engage in different activities, enjoy nature and safely play and make friends with other children. We don’t want them to feel boxed in, just how other condos feel. If I only brought proper swimming attire, I would've jumped into the pool! Bare two-bedroom model unit, showing the Toilet & Bath and entrance to two bedrooms. Bare unit, shot taken from one of the bed rooms. Amazed at how an empty unit could look big with the right mix of interior design, furniture and lighting! Here's a shot of the same model unit from another side. A spacious living area of joint units. This is HOME! Well-lit dining area strategically located near the kitchen. I would love to hang out in a clean kitchen as this. I could cook all day! Masters bedroom in the joint unit. That's me facing the mirror in the walking closet! Every mom's dream closet! Another Toilet and Bath model. He can't get enough of this room! Visualizing where he would put his collection of K-Zone magazines and his (future) Mac Book. He asked Ms. Tina of DMCI “How much do we pay for an unlimited stay?” That is actually an aspirational question from my son, who at 10 has a clear appreciation for beautiful things, scenery and ambience. He actually thought that we were in a resort and that we could rent a unit for days. That’s how DMCI Homes Rhapsody Residences is. My son and I are in harmony with what we felt when we toured the resort-inspired condominium village. Being there seems like you’ve escaped from the stressful hustle and bustle of the city life. It’s like attracting your inner peace so you could restore your balance. Everything we saw at DMCI Homes’ Rhapsody Residences is what hubby and I wanted for a place to call our own. I didn’t feel like a prisoner in a small and cramped space. It provided a breathable corridor because DMCI Homes made sure they put some greenery in the buildings’ hallways. DMCI Homes brings the nature inside every building's hallways, making living space breathable and Zen-like. I'm glad they designed the corridors this way, bringing nature close to home. They are complete with indoor and outdoor amenities and their facilities are more that what you expect. You don’t have to go elsewhere, everything is there. For me it’s a perfect place for a young family like ours to start. Rhapsody Residences is DMCI Homes’ Neo-Asian-themed mid-rise residential community located along East Service Road in Sucat, Muntinlupa City. 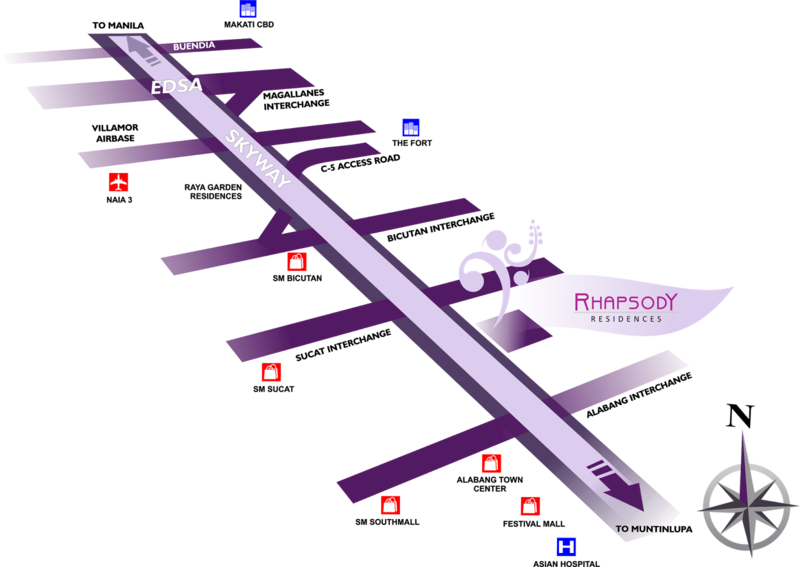 It is also perfectly located near hospitals, airports, supermarkets, malls, schools and churches. They have eight 5-storey condominiums and one 10-storey building within the village. Two-bedroom units of 50.5 to 82.5 square meters are available with one parking space per resident. Additionally, what I like about this resort-themed community is that it’s completely secured 24/7 because of the guarded entrance and roving security personnel. Basketball court and ample parking spaces for everyone. The Clubhouse lounge area where it absolutely makes a guest feel like he's in a resort. That's how we felt. Oh look! They have an Audio Visual room too! The children will definitely have fun here! I can just imagine. Parking space in every building is provided by DMCI Homes for its residents. One of the two huge function rooms available for private functions of guests. Open veranda at the second floor of DMCI Homes Rhapsody Residences' Clubhouse. Panorama shot of the Clubhouse showing the three swimming pools. 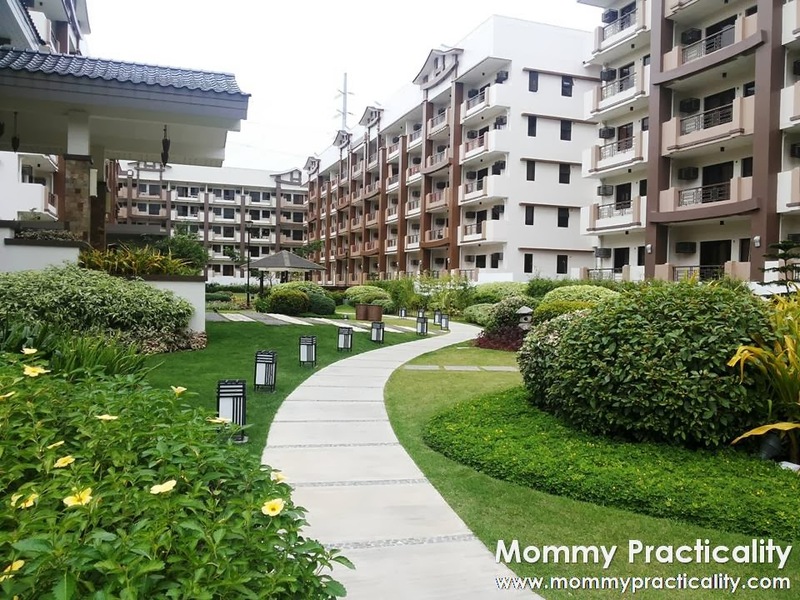 Truly, DMCI Homes Rhapsody Residences is where we wish to live in. My son undoubtedly loves everything he saw and experienced during the tour. For me, as a parent, it’s very important to also consider your children’s feelings about a life decision that you and your husband is going to make, such as buying a house. By the way, currently, six of the nine buildings are already tagged as “Ready For Occupancy.” I will definitely come back to tour Rhapsody Residences, this time, with the husband, so he could feel the peace and harmony I felt when I went there. hangganda... not that High Building..
Hi @Chin chin I know! That's why, truly we left our hearts there when we toured it! haaay! :) Feels good to be home at a place that feels and looks like a resort diba? Hi @Jocris Mangubat seeing this, my condo living prospective changed. I've always thought of it kasi as something I couldn't breathe well and feeling boxed in. I didn't get that feeling when we toured Rhapsody Residences! And oh my, the pool.. sobrang winner! Yeah. Agree. But they don't know the exact address. Is it Buli or Cupang is it 1700 or 1771 for postal code. Our agent lied to us for the sake of selling. Unfortunately already paid DP and 3 months for a rent to own. In house is double the price. Instead of paying 4 million we need to pay 9 million for 10 years term. It's a nice place no doubt about it. But taxi is not very common. Also traffic is bad. Turn over discussion says "any modification, addition or renovation on the unit or any part of the unit will void the warranty of the unit" Tell me how do you understand this? It is quite funny though because the guy said there are some exemptions, but not listed on the turnover contract. Also some of the documents are not very specific like we have 3 BR unit but on our contract it's on 2 BR because they said that's the standard. Hard to understand but can't waste money. Rhapsody indeed is a very nice place and a family friendly environment. But the service and the people who works for them, if I am going to rate them 1 to 5, 1 is the lowest. I'll give them negative 1. I called their customer care service because I wanted to know our exact address so we can do updates. And she just said "I work for DMCI not for Rhapsody, I don't know the address" as far as I know Rhapsody is part of DMCI. Sorry but you need to work on your people. DMCI you need to train your people very well. They are professionals and they need to act as one.